WOW!!!! Just does not describe how awesome this “Star Trek” like Laser Weapon is! 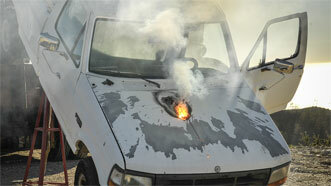 BETHESDA, Md., March 5, 2015 — Operating at the highest power ever documented for a system of its type, a laser weapon under development by Lockheed Martin disabled the engine of a small truck during a recent field test. The 30-kW ground-based prototype, called ATHENA (for Advanced Test High Energy Asset), burned through the engine manifold in a matter of seconds from more than a mile away. The truck was mounted on a test platform with its engine and drive train running to simulate an operationally-relevant test scenario.